Representing U.S. business interests in the European Union is the American Chamber of Commerce to the EU (AmChamEU, http://www.amchameu.eu/), a Brussels-based lobbying organization. EU Center study trip participants learned about the role of AmChamEU in a session that described the close economic ties of the U.S. and the EU. Laws affecting business in the European Union originate in Brussels. It is the goal of the Transatlantic Economic Council to stimulate growth, create jobs and decrease barriers to trade. The EU does not have a tradition of PACs and lobbying is minimal. AmChamEU has over twenty international employees, with only two (one full-time and one part-time) U.S. citizens on staff. The organization requires that personnel be knowledgeable about European business customs in order to advance U.S. business. Language facility must also be a factor in the scarcity of U.S. employees in this office. At the same location we had the opportunity to hear from representatives of the State of Illinois West European Office of Trade and Investment. The West European office, one of nine State of Illinois foreign offices worldwide, represents Illinois interests in thirteen countries. Of the eight U.S. states with business offices in Europe, Illinois is the fifth most successful. The Midwest is often overlooked when European companies are looking at U.S. expansion; instead they often opt for the East or West coasts. Although southern U.S. states are appealing because of lower prevailing wages, Illinois has a lot going for it as a potential site. Airport, highway and Mississippi River access provide excellent infrastructure. Contrary to widely held beliefs in the business community, there are no great concerns about taxes in Illinois. 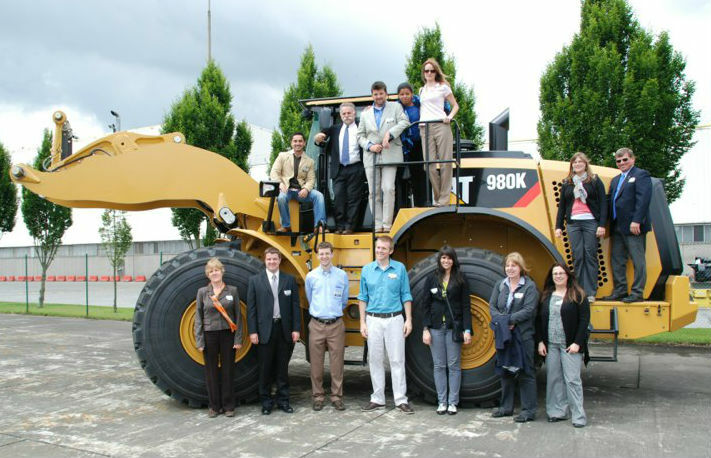 The ultimate in successful Illinois companies, Caterpillar, has its second-largest facility in Gosselies, Belgium, where 4,300 are employed (read more: Caterpillar Belgium Fact Sheet in PDF). Another 10,000 are employed indirectly by suppliers to Caterpillar Belgium. The 98-hectare facility has existed since 1965, exporting 97% of the hydraulic excavators, wheel-loaders, axels, cylinders, gears, and hydraulic valves produced on site. Caterpillar prides itself on remaining profitable and maintaining its two billion dollar yearly investment in research and development, even as the recent worldwide financial crisis forced other firms to scale back. Investment in the Gosselies facility averages €50,000,000 per year. Local managers and a visiting U.S. employee spent time with our group and answered many questions about the facility and its presence in Europe. Follow the link if you are interested in a job with Caterpillar Belgium: http://belgie.cat.com/careers/caterpillar-belgium. Keep in mind that concern about companies relocating to lower-wage regions is not only a fact of life in the U.S. Indeed, workers of the Gosselies plant staged a 24-hour strike in February of 2012 to highlight their concerns about the possibility of a production line moving to Poland. The EUC study trip provided tremendous background, fascinating contacts and exciting experiences for the participants in our study of the European Union. I look forward to sharing the lessons with my students this year. Thank you to all who made it possible! Alicia Henry teaches German I-AP at Normal Community West High School in Normal, IL.